Marsh Fork kids: What kind of justice is Menis? 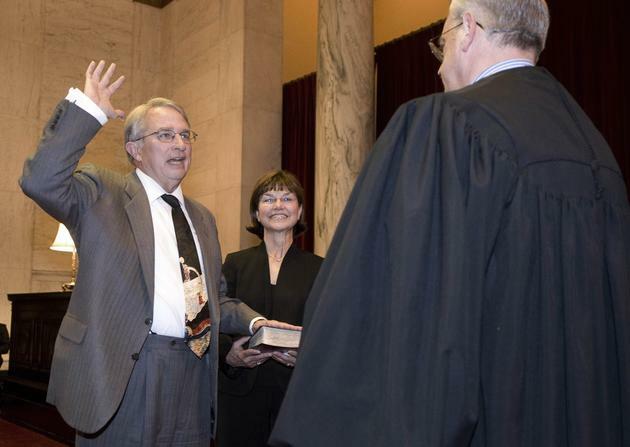 June 10, 2009 by Ken Ward Jr.
Menis Ketchum, left, is sworn in as a West Virginia Supreme Court Justice by Judge Michael Thornsbury, right, as his wife Judy Ketchum holds the Bible in the West Virginia Supreme Court chambers at the state capitol in Charleston, W.Va., Thursday, Dec. 18, 2008.Â AP Photo. Reactions are still coming in from around the country to yesterday’s West Virginia Supreme Court ruling to allow Massey Energy to continue its plans to expand the coal-processing facility it operates adjacent to Marsh Fork Elementary School in Raleigh County. One Coal Tattoo reader asked me in an e-mail message if I thought the justices had ever heard of Aberfan, the Welsh town where 144 people — including 116 children –Â died in 1966 (six years before the Buffalo Creek disaster) when a coal waste impoundment failed. (Some local folks had raised concerns three years earlier about the slag being piled above the village elementary school — but they were ignored). The Marsh Fork Elementary School might be the poster child for everything that is wrong about our failed mining policies: Only a few football fields downslope of a 2.8 billion gallon coal sludge impoundment, the school and its children are also subjected to the toxic coal dust within a football field of their playground. My question now is a little bit different, though very related: What does this ruling tell us about Menis Ketchum, the new state Supreme Court Justice who wrote it for the unanimous court? This case involves the interpretation of several statutes. 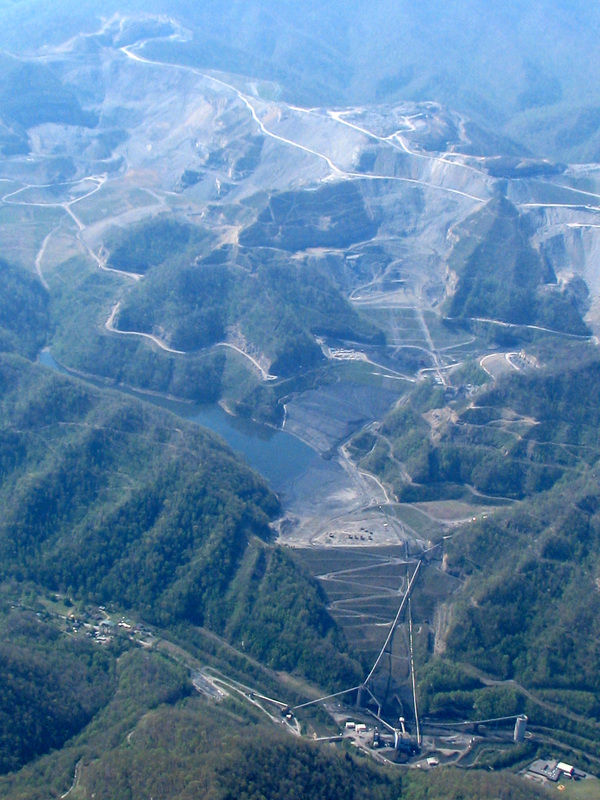 The sterile, narrow legal question presented by CRMWâ€™s appeal is simple: under the West Virginia Surface Coal Mining and Reclamation Act and the federal Surface Mining Control and Reclamation Act,Â is the â€œpermit areaâ€ of a surface mine operation defined solely by the maps submitted with the original permit application? Or may the permit area be defined by reference to the maps and markers buried or installed on the mining site? Â This case does not involve the public policy effects of these Acts. We are aware of the extensive public concern about appellee Goals Coalâ€™s decision to construct a second coal silo less than a football fieldâ€™s length from an elementary school. The DEP has determined it must allow the construction to occur in deference to statutory law. The wisdom or desirability of these decisions are outside the province of the judicial branch. I’ve highlighted the portion that lawyers for Coal River Mountain Watch urged the Supreme Court to pay attention to — the part that says the permit area is that boundary shown on the map, and the part, if enforced, that would kill Massey’s plan for this new coal silo. Massey and the Manchin administration’s Department of Environmental Protection argued that the other part of the definition was what mattered — that is, the part that says the true permit boundary is what the markers on the ground show (markers that, in this case, would clear the way for the silo). Coal River Mountain Watch argued that the comma after the word “appplication,” followed by the pronoun “which,” set everything off after the comma as a “nonrestrictive clause” that simply explained that the on-the-ground markers must reflect what was shown on the map. As I’ve written before, this dispute — maps vs. markers — was the legal issue at the heart of this case. This is the equivalent of the justices saying their hands are tied — As sympathetic as they might (or might not) be to the citizen group’s case, they could be saying, there’s just nothing they can do about it. But buried in a footnote in the case is clear evidence that the court didn’t really stop there … it did do some interpreting here. This conclusion is compelled by the fact that Congress expressed a preference that permit application maps be drawn on a scale of 1:24,000 or 1:25,000. 30 U.S.C. Â§ 1257(b)(13)(B). At the smaller of these scales, 1:24,000, 1 inch is the equivalent of 500 feet. At this scale, the thickness of a pen stroke of 1/20th of an inch identifying a boundary line would represent 25 feet on the ground. What’s that all about? Well, despite his protestations otherwise, Ketchum has in fact looked beyond the specific statutory definition of permit area, to a different section of strip mining law that he says bolsters his conclusion. And he’s done more than that. The good justice has also — drawing interestingly enough from Massey lawyer Bob McLusky’s brief, without saying so — gone beyond just reading the statute to interpreting it, by saying that the markers must be the permit boundary because making the maps the boundary would be impractical for the industry and WVDEP. This all reminds me of one of the first stories I did about Marsh Fork Elementary, back in the summer of 2005, when a grandfather named Ed Wiley went and sat on the Capitol steps here in Charleston, saying he wouldn’t leave until Gov. Joe Manchin agreed to meet with him about the school’s location.Â The governor agreed to meet with Wiley, and then ordered his top staffers to take a closer look at the situation. We now know that the WVDEP and Manchin backed off any real inquiry into the safety of the school, oddly enough not long after Manchin settled a civil rights lawsuit filed against him by Massey President Don Blankenship. But that day when he met with Wiley, the governor came back out to the Capitol steps and had a press conference with Wiley. Everybody was asking questions about their meeting. Â I don’t know enough. I haven’t been there. I don’t know enough about the site. By the way, here’s a fairly recent photo of the site, taken by Vivian Stockman of the Ohio Valley Environmental Coalition. That’s the school, all the way down in theÂ right-hand corner. I’m tempted to say that Justice Menis is a menace to justice, but where is the justice in this decision? Where is the concern for the health and safety of the children of Marsh Fork Elementary. Why does he look at one comma and ignore the intent of the law. Why are property lines always property lines unless Massey says they are otherwise? Why does Massey even bother with getting a permit in the first place? At this point, justice and fairness are of no concern. I hope the national media eats us alive… Judicial Hellhole, yes apparently so. Does the Queen of Hearts reign in West Virginia? On nearby MTR sites, the only “boundary markers” are pieces of vinyl siding, maybe 6″ by 12″, with the permit number written on them with a marker and nailed to trees. DEP inspectors can’t show you where they are on a map with any confidence, or locate the boundary from the map. The boundary is wherever the company decides to say it is. So why is it that the boundary at MFE the only one in the state, apparently, defined by a piece of pipe? Was there any detailed discussion of the nature of the markers, themselves? Are these USGS datums, or referenced to them? Are they rebar driven into the ground? What are they? Frankly, a wooden stake driven into the ground at the behest of a Massey employee is a far cry from being a dispositive indicator of a property line. Ultimately, the Court seems to have endorsed a bit of sophistry in which one determines map position from markers whose location at some point in time had to be determined from another map, perhaps ad infinitum. In the final analysis, it seems clear to me that the one thing the Supreme Court of Appeals of West Virginia DID was to show itself again cowed by Don Blankenship and Massey Energy. That in itself is sad, for it delineates a judicial death in this state from which it is impossible to turn one’s eye. The mining site that surrounds Marsh Fork Elementary is WV’s version of Area 51. What one observes with ones eyes is always either denied or explained away with bizarre governmental blabber. It now appears that the WV Supreme Court has been briefed about the National Security issues involved with MFE. Nothing else explains such a bizarre court ruling. Is there an alien spaceship beneath the dam? We are watching an injustice that slams in the face of the values and morals that our country was built upon. If this Governor does not now build these kids and teachers a new school, IN THEIR COMMUNITY, upstream away from this toxic nightmare, then we should call for his immediate impeachment. Numerous times Gov. Manchin has said he cares about these children. If that’s truly the case then in thebest interest of the children, build them a new school and get them out of there. Ken, I’ve written a musical re: MTR. On the cover of the CD drawn from it, named Co2al Train to Amos, is a photograph of Marsh Fork from the opposite end from Vivian’s. Among the songs is one called “Buffalo Creek and Aberfan.” It is worth a listen and can be found on CDbaby. Check it out. Judges cannot ethically defend their decisions so I respond to your question – what kind of justice does this decision show Menis Ketchum to be. The answer is, I think, one who knows the proper role of courts. For our long standing system of checks and balances to work, courts must confine their decisions to interpreting what the legislature has said and determining if the executive acted within legislative and constitutional powers and authority. That’s what this decision did. Remember, it affirms an interpretation made by the DEP, which has experienced experts in enviromental enforcement, affirmed by its Board of Review, which is likewise composed of such experts, and affimed by the Circuit Court. The decision was unanimous, with all five Justices joining Justice Ketchum’s writen opinion. You apparently believe the result wrong and somehow unfair. If you are right, your complaint should be to the legislature and congress, as they make laws based on what is fair. The experts at DEP and OSM take those laws and apply them to the facts. Courts merely decide if the experts’ decision comports with that legislation. They do not apply their own ideas of fairness. If you think they should, immagine t the 2002 elections turning out with the candidates supported by business making those policy decisions, instead of legislators. Justice Ketchum’s decision was proper because he and his colleagues acted as judges, applying the law, not dictators, making it to suit their own sense of fairnss. This is the same old run around. The markers surprisingly and miraculously appeared after you found the errors on the permit map. The marker supposedly was where there was a coal load out zone. An elderly person who worked at the original mine stated positively that there had never been a coal load out on the mining site. He was, of course, ignored, just as those of us who fight for the safety and health of the children are ignored. Ask yourself if you would send your children to Marsh Fork Elementary. If you would not it is time that you and everyone else in West Virginia stand up for these children. We will not be ignored. This is not the end of the story. Thanks very much, as always, for your comment. I’ve always appreciated hearing what you have to say. Of course, I’m not burdened with having gone to law school. But the point I was trying to make was that I think the opinion — especially the telling Footnote No. 6 I mentioned — show clearly that the court did more than just read the plain language of the statute. If they believe this is a case where that is warranted, then fine. But I was puzzled by their hiding behind this business of simply reading the statute when they clearly did more than that. But as I said I appreciate your comments, and I hope you continue to contribute to Coal Tattoo’s efforts to discuss these issues. I welcome folks like yourself who try to keep me honest or put me in my place in a polite but forceful way. Despite note 5, I believe the only fair reading of the gist of the decision is one of judicial deferral to policy and fairness decisions made by the legislative and executive branches. Note 5 has no more effect than noting in passing that the decisions rejecting intepretative and factual aguments not fully dealt with because of the proper standarde of court review were not without legitimate dispute. I do not think a law school education is required to understand my reasoning. It is basic political science that our system of checks and balances require that courts defer in these situations. One of the basic themes of the Federalist Papers is the limitaion on tyranny which that separation provides. This story, like so many others all over America,does nothing more than emphasize the lack of concern these ‘men’ have for the very public they swore to defend and proving, once again, that ‘justice’ is merely a word that like .morality., is obsolete in America. Our ‘Justice System’ (from the local front all the way to the Supreme (?) Court is ‘bought and paid for by big business and corrupt politicians. IF it were any of MY children in that situation….I would MOVE.You have no alternative, folks, because neither ‘His Honor’ NOR Massey Coal Co. will EVER do anything because they are alaves to GREED & POWER! May God help you, because they won’t!